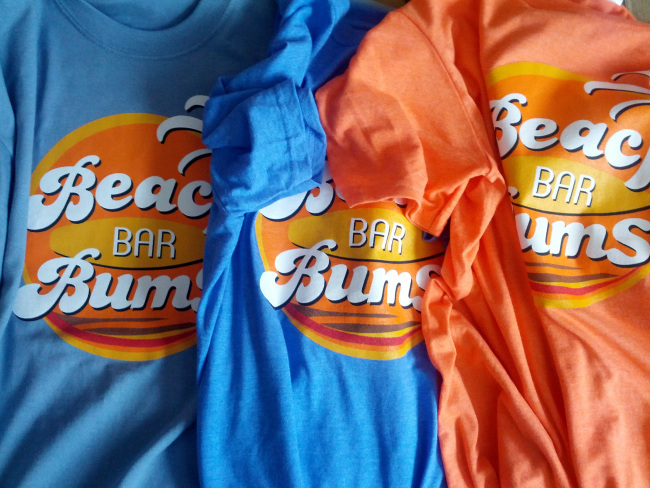 Beach Bar Bums Online Store is Open! Home » Store » Beach Bar Bums Online Store is Open! It’s been a labor of love that started last fall with the creation of a logo for my Beach Bar Bums Facebook page, blog and other online sites. After hearing there was some interest in buying shirts and can koozies with the logo on it, I started exploring this possibility. I was able to find a great local company to work with and more than six months later, the online store has finally opened! I knew one thing going in – I wanted to offer an inexpensive t-shirt with just the logo on it that was 100% pre-shrunk cotton and would last for a long time. I know we found that in the Gildan 2000 for men (if you own t-shirts, you probably have this one – it’s ubiquitous) and the Anvil 652 for women. The Gildan 64000 Softstyle t-shirts are for those of us who prefer a lighter weight t-shirt with a more fitted shape. The Softstyle t-shirt is as soft as the blankie you used to have as a child … or maybe still do. 🙂 The heather orange version will not be produced again unless the demand is high. Quantities on both the heather orange and heather royal are very small so grab them while you can! While the selection right now is limited to what I refer to as our “original logo shirts” and koozies, there are plans to offer more t-shirts and other merchandise in the future. In fact, the next t-shirt I have planned is a collaboration we did with a rock band out of New York City with one of their songs. I’m pretty stoked about it and hope to get it up on the website soon. Also, we plan on offering charitable clothing for a cause down the road. Giving to charities has always been high on my list, especially since the birth of my daughter, and we already have one design ready to print. I’m working on the final details and looking for partners to help with the funding but the plan is that $5 from the sale of each of these shirts will go to a charity. The best part about it – you’ll be able to help choose the charity! Stay tuned for more details …. It’s been a long road and I now know more about t-shirts, designs, the printing process, order fulfillment, website development, online marketing, SEO, etc. than I ever thought I would! I may only sell five of these and never get to place another order for more merchandise but when it’s all said and done, at least I’ll be able to say “I tried” and that’s good enough for me. To check out the new store and order a bunch of t-shirts for yourself, family and friends (Pretty please! ), visit https://www.beachbarbumsstore.com/. It’s important to use the https:// part of the address. For reasons I don’t comprehend, you can’t just type in the www… address. I do know the “s” makes it secure and that’s a good thing! Happy shopping!